The etiology of the autoimmune disease systemic lupus erythematosus is not known, but aberrant apoptosis and/or insufficient clearance of apoptotic material have been assigned a pivotal role. During apoptosis, nucleosomes and several endogenous danger-associated molecular patterns are incorporated in blebs. Recent data indicate that apoptotic blebs induce maturation of myeloid dendritic cells, resulting in IL-17 production by T cells. In this review we summarize current knowledge on the role of dendritic cells in the pathogenesis of systemic lupus erythematosus with special emphasis on the uptake of apoptotic blebs by dendritic cells, and the subsequent induction of Th17 cells. Systemic lupus erythematosus (SLE) is a complex, multiorgan, autoimmune disease. It is characterized by an autoimmune response directed against multiple nuclear components, of which the nucleosome is the major autoantigen . SLE autoantigens cluster in blebs formed at the surface of apoptotic cells . The exact etiology of SLE is still unclear, although insufficient clearance of apoptotic material and/or aberrant apoptosis, in combination with a susceptible genetic background, have been suggested to be involved in SLE development and progression [3, 4]. Multiple SLE-associated autoreactive antibodies, which are found in both SLE patients and lupus mouse models, recognize apoptosis-induced modifications of nuclear autoantigens. It has been demonstrated that the pathogenic autoantibodies result from CD4+ T cell-dependent immune responses. Activation of the autoimmune T helper (Th) cells requires immunogenic antigen presentation by dendritic cells (DCs) . Here, we provide an overview of the role of DCs and their response to apoptotic material in the pathogenesis of SLE. At the interface of innate and adaptive immunity, DCs play a pivotal role in the regulation of immune responses. DCs are distributed throughout the body for optimal antigen capture and, as the most potent antigen presenting cells, they are well suited to activate (naïve) T cells. On the other hand, immature DCs can promote epitope-specific peripheral tolerance by presenting antigens acquired from dying cells without co-stimulation of T cells. This results in anergy or deletion of self-reactive T cells and the development of regulatory T cells (Tregs) . Depletion of DCs in mice results in breaking of self-tolerance of CD4 T cells and induction of spontaneous autoimmunity , reflecting the importance of DCs in peripheral tolerance. On the other hand, inhibition of apoptosis in mouse DCs by Bim-deficieny leads to overstimulation of T cells by DCs. This overactivation of T cells then results in breakage of self-tolerance and induction of autoimmunity in mice , indicating the ability of DCs to induce autoimmune responses. When an antigen is perceived by DCs as being harmful, T cells recognizing the antigen will be activated. In order to activate T cells, DCs undergo a process called maturation, migrate to secondary lymphoid organs, and present antigens in an immunogenic context to T cells. During the process of maturation, DCs are transformed from predominant antigen-capturing cells towards antigen-presenting cells. DCs thereby increase the expression of antigen-loaded major histocompatibility complex (MHC) molecules, upregulate the expression of co-stimulatory molecules (that is, CD86, CD40) and secrete pro-inflammatory cytokines and chemokines, such as IL-6 and TNF-α . Furthermore, the signature of the secreted cytokines and the molecules expressed on the cell surface (for example, OX40 ligand (OX40L) or ICOS-1 (inducible costimulator-1)) determine the type of T cell polarization, for example, Th1, Th2, Th17, or Treg . DCs can be divided into several subsets, which display different characteristics and tissue distributions. Discussing all possible DC subsets is beyond the scope of this review, but currently two main types of DC are known: myeloid DCs (mDCs), and plasmacytoid DCs (pDCs) [9, 10]. The number of DCs circulating in blood is relatively low; therefore, in vitro cultured DCs are often used in studies. Human mDCs are predominantly generated by culturing monocytes in the presence of granulocyte-macrophage colony-stimulating factor (GMCSF) and IL-4; these cytokines are also mainly used to generate mDCs from mouse bone marrow. pDCs were previously isolated from blood, but nowadays they can also be generated after culturing human monocytes or mouse bone marrow in the presence of Flt-3 ligand (Flt-3L). 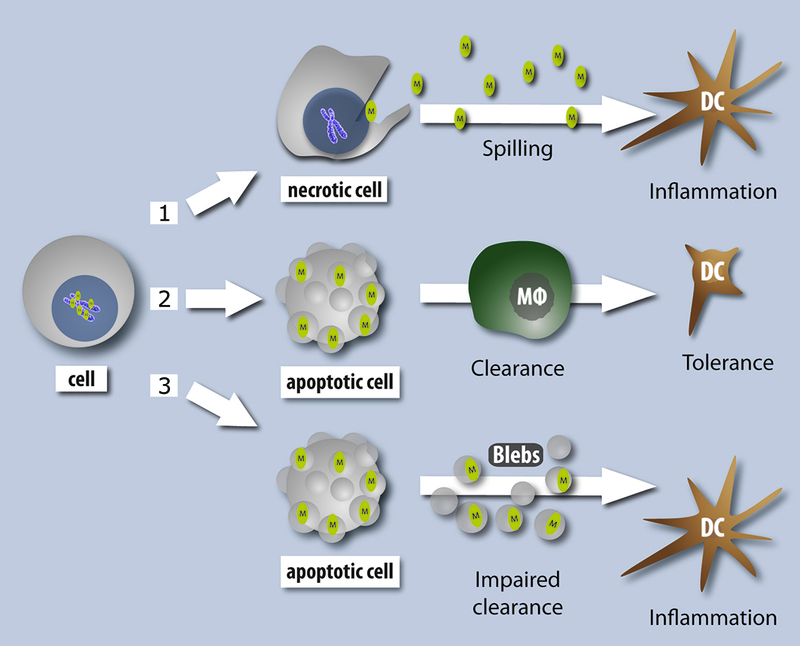 An important characteristic of mDCs in the context of SLE is their ability to take up apoptotic and necrotic cell material  and present this to T cells . In contrast to mDCs, pDCs are unable to ingest uncomplexed apoptotic and necrotic material . However, when apoptotic material is in complex with (auto)antibodies, pDCs ingest these complexes. pDCs can produce high amounts of type I IFN (mainly IFN-α) and were, therefore, originally referred to as the natural interferon-producing cells . Interestingly, high levels of IFN-α are found in SLE patients, suggesting the involvement of pDCs in the pathogenesis of SLE . The activation and maturation of DCs can be accomplished by numerous agents, such as microorganisms, immune complexes, various cells of the innate and adaptive immune system, dying cells, or material derived from dying cells [5, 8, 14]. In the case of microorganisms, pathogen-associated molecular patterns (PAMPs) are recognized by DCs via pathogen recognition receptors (PRRs). These PRRs comprise Toll-like receptors (TLRs), C-type lectin receptors, the intracellular RIG-I-like receptors and NOD-like receptors, of which the TLRs have been studied in most detail [10, 14]. However, TLRs are not solely stimulated by PAMPs, but also by endogenous TLR ligands, which can be released from dying cells and are referred to as danger-associated molecular patterns (DAMPs). Expression of the PRRs varies between the DC types and subsets, and also differs between species. With regard to TLRs, mDCs express most of the known TLRs, whereas pDCs predominantly express TLR7 and 9. Currently, the involvement of TLR triggering by DAMPs in auto-immune diseases, and SLE in particular, is an area of active research . We will address this topic in more detail below. An increased load of apoptotic material has been related to the induction of SLE and the disease severity [3, 4]. This increased load of apoptotic material can, in theory result from aberrant apoptosis and/or insufficient clearance of apoptotic cells [15, 16]. While some limited data support an increased rate of apoptosis in SLE in humans, animal models have shown that aberrant apoptosis, as in mice with defective Fas (lpr) or Fas ligand (gld), results in lymphoproliferation and autoimmunity with SLE-like features. Deregulated apoptosis ultimately leads to increased amounts of apoptotic cells at the wrong time or in a wrong micro-environment. However, an increasing body of evidence indicates that insufficient clearance is probably a more important cause of the increased load of apoptotic material in SLE. In contrast to the normal situation, where early apoptotic cells are swiftly removed by phagocytosis, insufficient clearance of apoptotic cells and material may result in accumulation of these in tissues, and apoptosis can then proceed to secondary necrosis and to the release of inflammatory stimuli. Apoptotic blebs, containing clustered autoantigens, are formed at the surface of the dying cell. As long as cells are not cleared, apoptosis continues and the formed blebs will separate from the apoptotic cell. 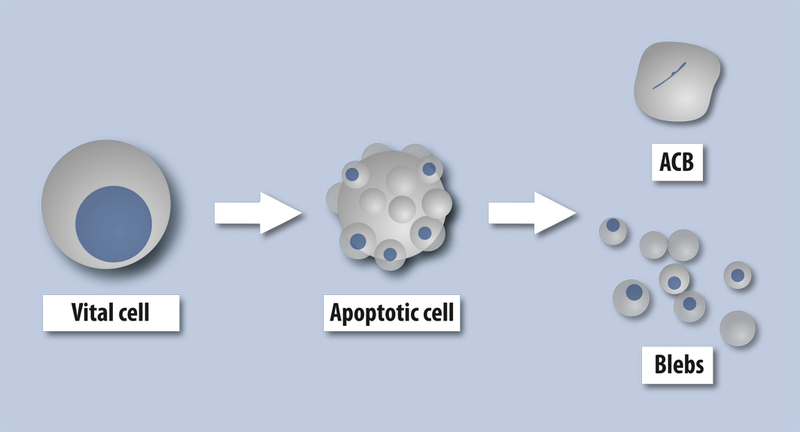 We define an apoptotic cell body as an apoptotic cell that has finished blebbing (Figure 1). In SLE patients, several abnormalities have been found that can result in decreased clearance of apoptotic cells and the release of blebs and chromatin, such as complement defects , low levels of the pentraxin C-reactive protein , and reduced levels and activity of DNase I in serum . The association between factors involved in reduced apoptotic cell clearance and SLE has also been found in animal models of SLE. In mice, the absence or decreased levels of complement component 1q (C1q), serum amyloid P component, DNase I, c-mer, or milk fat globule epidermal growth factor 8 results in lupus-like manifestations . Scheme defining apoptotic blebs and apoptotic cell bodies. From left to right are a healthy cell, an actively blebbing apoptotic cell, and an apoptotic cell body (ACB), remaining after the cell has finished blebbing, with separated apoptotic blebs (blebs) . Insufficient clearance of apoptotic material does not directly provide an explanation for the pathogenesis of SLE, since tolerance towards self is not automatically affected. The immune system is constantly in contact with numerous self-antigens, and it harbors multiple mechanisms to prevent autoimmunity [5, 20, 21]. Yet, one can imagine two pathways leading to an immune response against self-antigens. First, self is presented in an immunogenic context by antigen-presenting cells - for example, DCs - to auto-reactive T cells that have escaped central and peripheral tolerance mechanisms. The activated T cells provide the help needed for the subsequent activation of autoreactive B cells presenting the self epitopes. Second, modified or cryptic self is presented in an immunogenic context by DCs to T cells. When B cells ingest modified self that is recognized by their B cell receptor, they will present the peptides derived from this material. The activated T cells recognizing modified peptides can provide the help necessary for the activation of these B cells, resulting in the production of antibodies directed towards modified self. Because the tolerance mechanisms for B cells are less stringent than those for T cells, natural autoreactive B cells specific for unmodified parts of self-antigens are present. In SLE patients, this fraction of autoreactive B cells is probably even larger than in healthy individuals . Since these B cells can present peptides derived from the modified as well as the unmodified parts of the ingested antigen, they can receive help from activated T cells recognizing any one of these peptides. This mechanism of epitope spreading will ultimately result in the activation of various autoreactive T and B cells. We favor an important contribution of this second pathway, where the initial response is directed towards modified self, since it does not require the failure of physiological tolerance mechanisms. Experimental evidence for the involvement of modified self is found in the specificity of autoantibodies that are found in SLE patients. Antibodies from these patients recognize self-antigens that are modified during the process of apoptosis. This is exemplified in one of our own studies showing autoantibodies recognizing apoptosis-modified histone H4 . mDCs are excellent phagocytes of apoptotic material and, after maturation, are the most potent antigen-presenting cells for the activation of (naive) T cells [5, 11]. Maturation of DCs can be induced by ligation of CD40 and by a diverse range of PAMPS, which are recognized by the DCs via TLRs and other PRRs. However, in addition to exogenous TLR ligands, more and more endogenous ligands, or DAMPs, have been identified [14, 24]. When apoptotic cells are not swiftly removed, they release blebs and enter a late apoptotic stage, which is also called secondary necrosis. In this situation there is a huge spill of DAMPs, as in primary necrosis (Figure 2). As outlined below, there is evidence that these DAMPs, as well as apoptotic blebs and modified autoantigens, are able to induce maturation of DCs. When apoptotic T cells are captured by DCs, the expression level of CD40 ligand (CD40L), which is increased by activating stimuli, affects the maturation of DCs [25, 26]. Furthermore, the level of maturation of DCs also depends on the amount of apoptotic material to which they are exposed [27, 28]. The final common pathway of these mechanisms is that in conditions of disturbed apoptosis and/or insufficient clearance, the apoptotic (modified) antigens will be presented in a more immunogenic way by DCs to T cells. A well known endogenous danger signal is the high-mobility group box 1 protein (HMGB1), which can activate DCs via TLR2, TLR4 and the receptor for advanced glycation end products (RAGE) . HMGB1 was identified as the factor in HMGB1-nucleosome complexes from apoptotic cells that induced maturation of DCs via TLR2. In contrast to nucleosomes from normal cells, apoptotic nucleosomes induced auto antibody production in normal mice . Other endogenous ligands for TLR2 and TLR4 are certain heat-shock proteins and heparan sulfate . Nucleic acids are endogenous ligands for the endosomally located TLR3, 7, 8, and 9. Double- and single-stranded RNA induce maturation of DCs through TLR3 and TLR7/8, respectively, while CpG containing double-stranded DNA is a ligand for TLR9. When DNA-containing chromatin is bound to autoantibodies, the immune complex can enter the endosome via Fc receptor-mediated uptake and thus activate DCs in a TLR9-dependent manner [31, 32]. However, a TLR-9-independent activation of mDCs by chromatin-immunoglobulin complexes or nucleosomes has also been described [23, 32, 33]. We have shown that nucleosomes containing apoptotic histone modifications are far more potent in inducing maturation of mouse mDCs than unmodified nucleosomes . Notably, there can be an interaction between the various pathways of DC activation by endogenous ligands, since an essential role for HMGB1 and RAGE was demonstrated in TLR9- dependent activation of plasmacytoid DCs and B cells . It was recently discovered that DAMPs can also ligate CD24, which binds to Siglec G (mouse) or Siglec 10 (human), and thereby repress the pro-inflammatory response . This suggests that the response to DAMPs depends on the balance between positive and negative signaling pathways. In this respect it is interesting that a polymorphism in human CD24 is associated with susceptibility to autoimmune diseases, including SLE . Immunogenic properties of the late apoptotic and necrotic cells. 1, Necrotic cells and late apoptotic/secondary necrotic cells spill maturing agents (M; such as HMGB1 and nucleosomes) into the environment, and consequently create inflamatory conditions. 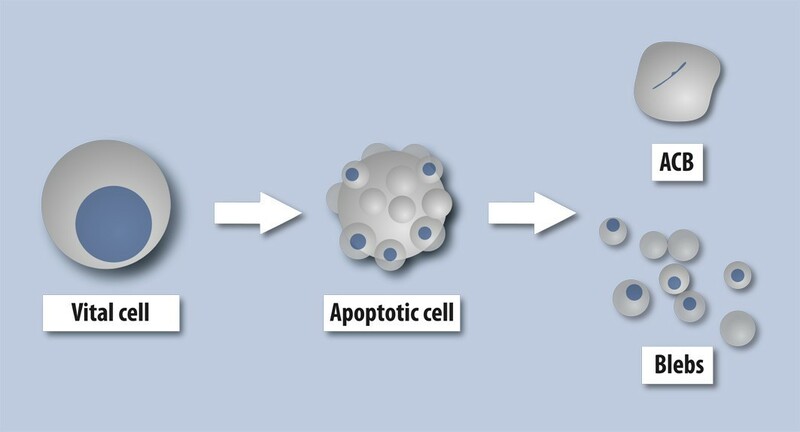 2, Under normal conditions, apoptotic cells do not spill maturing agents, but are removed efficiently by neighbouring cells and phagocytes, such as macrophages. 3, When the clearance of apoptotic cells is diminished and/or excessive apoptosis occurs, blebs are segregated from the apoptotic cell body and can induce maturation of dendritic cells (DC) upon ingestion. MF, macrophage. We recently found that apoptotic blebs can induce maturation of mouse mDCs with the production of high amounts of IL-6 . This effect was not observed with apoptotic cell bodies, the remainder of the dying cell after blebbing has finished. Interestingly, many of the potential endogenous ligands that can activate DCs, including RNA, DNA, and HMGB1, are found in blebs [37, 38]. In addition, HMGB1 remains attached to the nucleosomes that are released from late apoptotic cells . Taken together, the disturbed clearance of apoptotic cells leads to an accumulation of blebs with immunogenic modification of autoantigens. The simultaneous presence of endogenous danger signals and possibly a deficiency of regulatory pathways will enhance the ability of DCs to initiate an immune response to (modified) autoantigens. 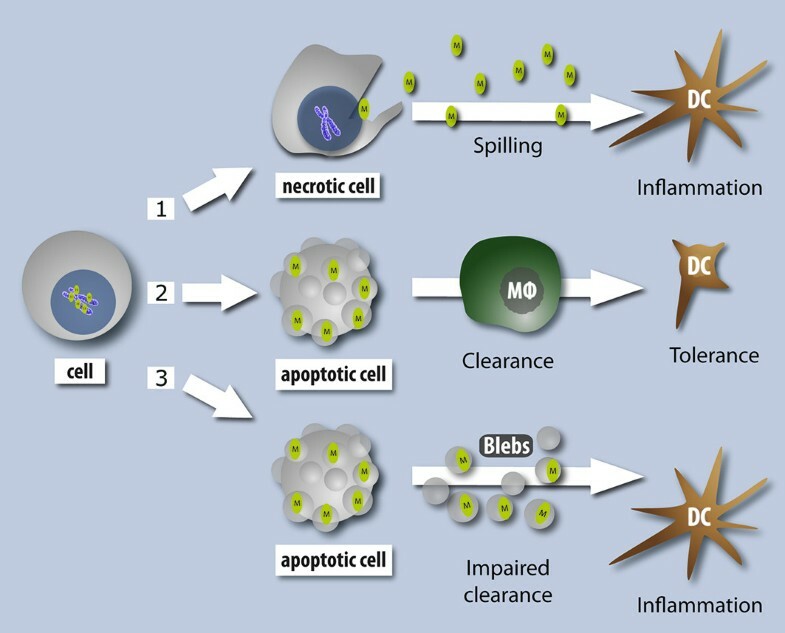 The important role of DCs presenting apoptotic material in the pathogenesis of SLE is illustrated by studies showing that administration of mDCs loaded with apoptotic or necrotic cells can induce the formation of antinuclear antibodies in normal mice and in lupus mice [39, 40]. Furthermore, vaccination with these DCs in lupus mice increased the disease severity [39–41]. The involvement of TLRs in the pathogenesis of SLE is supported by the observation that lupus-prone mice deficient in MyD88, a critical adaptor in most TLR signaling, did not develop autoimmune nephritis . Accordingly, lupus-prone mice that are deficient in Sigirr, a negative regulator in TLR signaling, show accelerated disease progression . In TLR9-deficient lupus-prone mice, the generation of anti-DNA and anti-chromatin autoantibodies was impaired , which was, however, dependent on the genetic background. Furthermore, a protective effect of TLR9 signaling has also been described in animal models . In humans, an association between genetic variation in TLR9 and SLE susceptibility could not be demonstrated . The involvement of TLR7 signaling in SLE pathogenesis is especially evident from mouse studies. The generation of autoantibodies recognizing RNA-containing antigens was shown to be TLR7 dependent . Furthermore, the RNA component of the Sm/RNP (Smith antigen/small nuclear ribonucleo-proteins) and SS-A 60 lupus autoantigens contributes to DC maturation in vivo, probably via a TLR7- dependent pathway . Overexpression of TLR7 caused profound DC dysregulation, increased levels of proinflammatory cytokines, such as IL-6 and TNF-α, in sera, SLE autoantibody production and fatal systemic autoimmunity [48, 49]. However, no evidence for increased TLR7 expression was found in SLE patients . When signaling via TLR3, TLR7, and TLR9 was abolished simultaneously in lupus-prone mice, the production of antinuclear antibodies and disease manifestation were markedly reduced . As proposed by Baccala and colleagues , the dependency on TLR signaling may vary with the phase of SLE development. The initiation phase might concern TLR-independent maturation of DCs by apoptotic material and associated nucleic acids. After the formation of autoantibodies an amplification phase can be initiated where Fc receptor-dependent uptake of nucleic-acid-containing immune complexes induces TLR-dependent maturation of DCs. Taken together, evidence for a role for TLRs in the pathogenesis of SLE is mainly derived from animal models, and the relevance in human lupus has still to be shown. As outlined above, the interaction between DCs loaded with antigens derived from apoptotic cells and naive T cells can give rise to various responses of sub populations of T cells. First, when immature DCs present self antigens in a tolerogenic way, autoreactive T cells are deleted or anergized, and regulatory T cells can be activated. The development of regulatory T cells largely depends on the presence of TGF-β. When mature DCs present antigens in an immunogenic way, cytotoxic T cells as well as helper T cells can be activated. Helper T cells have traditionally been divided into type 1 (Th1) and type 2 (Th2) subsets, and until recently many auto immune diseases were associated with a Th1 type of autoimmune response . However, recent data have clearly demonstrated a crucial role for the IL-17 producing Th17 subset in autoimmune diseases . For example, in contrast to the Th1-promoting cytokine IL-12, the Th17- promoting cytokine IL-23 is involved in joint destruction in a rheumatoid arthritis model. Blocking IL-17 with a monoclonal antibody decreased intestinal inflammation significantly in a mouse model for inflammatory bowel disease . In mice, both Th17 and Tregs require TGF-β for their development. However, in the presence of IL-6 the development of Tregs is decreased, and their suppressive function is inhibited , whereas the combination of IL-6 and TGF-β is required for Th17 development . Further more, IL-23 and IL-21 mediate the efficient expansion of the Th17 subset . In humans, the development of Th17 cells appears to be different from mice, although there is no consensus when comparing various studies. Several studies using human cells demonstrated that as well as IL-6 and TGF-β, Th17 cell activation and differentiation can involve IL-1β, IL-21, and IL-23 . Compared to other autoimmune diseases, little is yet known about the role and involvement of Th17 cells in SLE. However, there are several indications that Th17 cells and cytokines involved in activation and expansion of these cells are important. For instance, hyperproduction of IL-17 and IL-23 was observed in SLE patients . Besides producing IFN-γ, expanded double negative T cells from SLE patients were found to produce significant amounts of IL-17. These double negative IL-17-producing T cells were shown to infiltrate kidneys of lupus patients with nephritis . In addition, increased numbers of Th17 cells are associated with disease flares of SLE. During these flares the Treg population was contracted . Lupus mice deficient in TNF receptor 1 and 2 develop accelerated lupus via a Th17-associated pathway . Furthermore, IL-21 signaling was shown to be important in disease pathogenesis in lupus-prone mice . Effective peptide tolerance therapy in lupus mice was associated with reduced numbers of Th17 cells and expansion of Tregs. DCs from tolerized mice, especially pDCs, were altered and produced increased levels of TGF-β and decreased levels of IL-6 after stimulation with nucleosomes, a condition favoring the expansion of Tregs . In conclusion, several lines of evidence support that Th17 cells and related cytokines are important in the pathogenesis of SLE. As described above, mDCs that are co-cultured with nucleosomes, nucleosomes modified during apoptosis, or apoptotic blebs gain a mature phenotype and produce high concentrations of IL-6. In addition, we found that when mouse mDCs matured by apoptotic blebs are used as stimulator cells in an allogeneic mixed leukocyte reaction, they induce IL-17 production by responder splenocytes . This suggests that the TGF-β-facilitated induction of Tregs under non-inflammatory conditions can be diverted to Th17 activation and development when mDCs produce high levels of IL-6 after interaction with nucleosomes or blebs released from apoptotic cells. 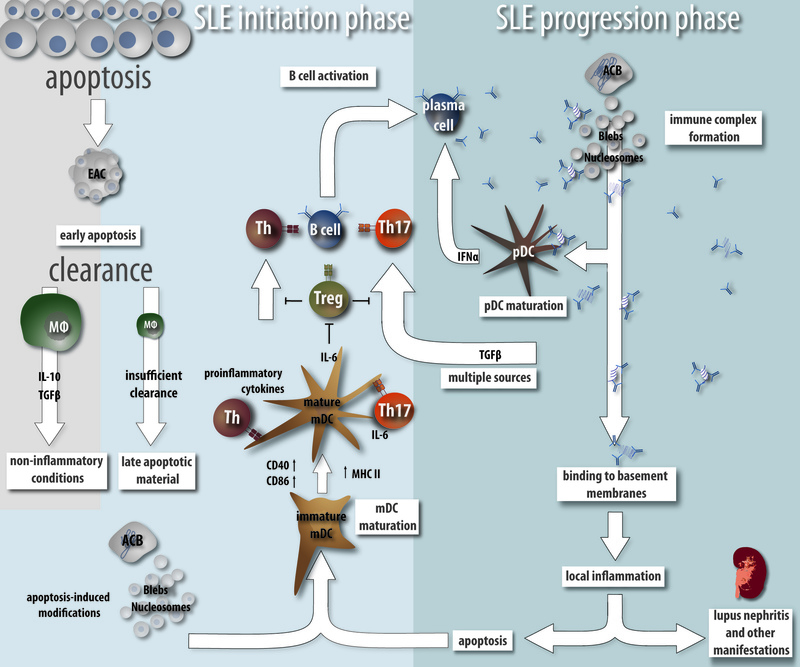 The etiology of SLE is multifactorial, with evidence for the involvement of genetic predisposition, certain pathogens, a decreased lymphocyte responsiveness to Treg suppression, gender-dependent differences in T cell activation, alterations in the complement system, an enlarged naive, mature autoreactive B-lymphocyte pool , and aberrant apoptosis and/or insufficient clearance of apoptotic cells [3, 4]. Based on our current knowledge, we propose the following model, which is graphically depicted in Figure 3. Due to aberrant apoptosis, and/or insufficient clearance of apoptotic cells, combined with a SLE-susceptible genetic background, high (local or systemic) concentrations of apoptotic nucleosomes and blebs are present in SLE patients. These apoptotic nucleosomes and blebs can then be ingested by mDCs. Nucleosomes that are modified during apoptosis, and/or endogenous danger ligands incorporated in blebs are responsible for the maturation of mDCs, which subsequently secrete proinflammatory cytokines such as IL-6, and present apoptosis-induced, modified auto antigens in an immunogenic way to T cells. The development and activity of Tregs is inhibited by IL-6, whereas IL-6 may, in combination with TGF-β and/or other proinflammatory cytokines, lead to the activation of Th17 cells and other Th cell subsets. Although the initially activated Th cells may be specific for modified autoantigens, epitope spreading will account for activation of B cells specific for modified as well as unmodified autoantigens. The produced autoantibodies will form immune complexes with antigens released from improperly cleared apoptotic cells. The opsonization of apoptotic material by auto antibodies enhances its uptake by mDCs . Moreover, pDCs encountering these immune complexes produce high concentrations of IFN-α , which adds to the maturation of mDCs and supports isotype switching and autoantibody production by autoreactive B cells . In this way, pDCs can amplify the autoimmune response initiated by mDCs. Moreover, the immune complexes can bind to basement membranes in diverse organs, causing inflammation, which leads to the various disease manifestations, including lupus nephritis, and tissue destruction . In turn, the tissue destruction can result in a local increase in apoptosis, yet another positive feedback loop that contributes to a progressive course of the disease in time. Model for the development of systemic lupus erythematosus and its inflammatory manifestations. In systemic lupus erythematosus (SLE), aberrant apoptosis or insufficient clearance of apoptotic cells leads to the local or systemic presence of high amounts of apoptotic blebs and nucleosomes, which are modified during apoptosis. These are then taken up by immature myeloid dendritic cells (mDCs). After ingestion of apoptotic blebs or nucleosomes, mDCs gain a mature phenotype with increased expression of costimulatory molecules (for example, CD40 and CD86), and production of proinflammatory cytokines, such as IL-6. Mature mDCs can induce activation of Th1 or Th2 cells and, in the presence of TGF-β, IL-6 and/or other proinflammatory cytokines, also support the development of Th17 cells. Next to its role in Th17 development, IL-6 inhibits the development and activity of regulatory T cells (Tregs). After activation by T helper (Th) cells, autoreactive B cells produce autoantibodies, which can form immune complexes with apoptotic material. Plasmacytoid dendritic cells (pDCs) preferentially take up these immune complexes and subsequently produce high amounts of IFN-a, which enhances autoantibody production and isotype switching. This results in increasing concentrations of immune complexes, which can associate with the (glomerular) basement membrane. The resulting influx of immune cells ultimately gives rise to multiple disease manifestations, including lupus nephritis, and local tissue damage, thereby inducing an increase in apoptotic cells, which 'feeds' mDCs with immunogenic material. ACB, apoptotic cell body ("late apoptotic cell"); Blebs, apoptotic blebs; EAC, early apoptotic cell; MF, macrophage; mDC, myeloid dendritic cell; Nucleosomes, apoptosis-induced hyper acetylated nucleosomes; pDC, plasmacytoid dendritic cell; Th, T helper cell; Treg, regulatory T cell. Based on this model we postulate that DCs play a pivotal role in the initiation and progression of SLE. 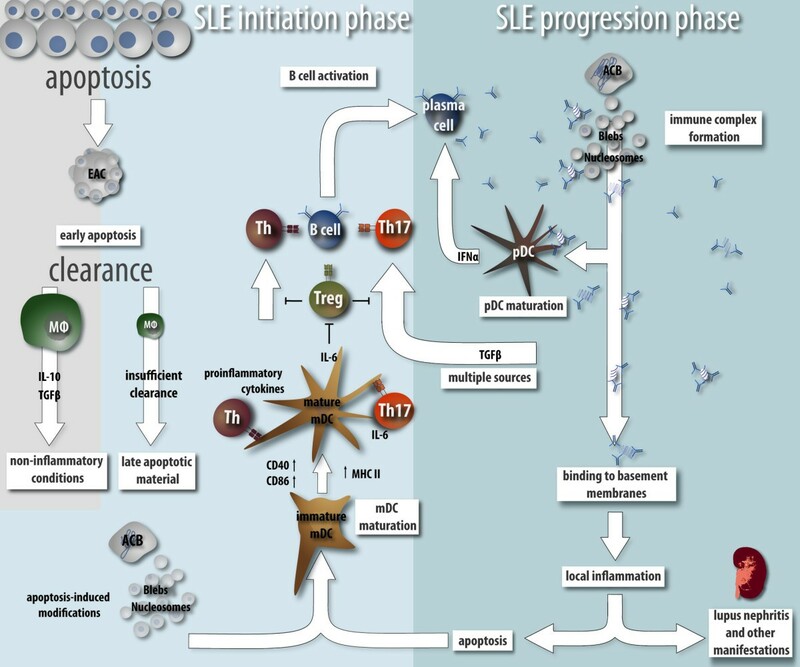 Although SLE patients are often treated with rather unspecific immunosuppressive drugs, the data presented here suggest that specific interference in the maturation of DCs, TLR signaling, or the development of certain T cell subsets might become attractive treatment goals. For example, hydroxychloroquine, which inhibits signaling via TLR3, 7, 8 and 9 by blocking the acidification of endosomes, is a well known effective drug in the treatment of SLE patients . Furthermore, inhibition of TLR7 and 9 was recently shown to ameliorate the disease manifestations in lupus-prone mice . Further knowledge of the role of endogenous apoptotic (modified) compounds and their receptors in the maturation of DCs and the activation of specific T cell subsets, such as Th17 cells, may reveal novel targets for the specific treatment of SLE.